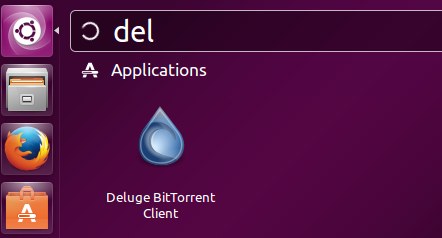 Deluge is a well known torrent tool which is based on Bit torrent application. It is a feature rich and cross platform application and works on all popular operating systems including Linux, Mac and Microsoft Windows. The main design goal of this application is to provide a lightweight torrent application. Here are some of the amazing features of this application. It runs a daemon and provides an awesome User Interface. It is GTK+ based application and uses Local Peer Discovery (LPD) mechanism. It is an extension for FAST protocol and uses UPnP and NAT-PMP protocols. It provides you good control over torrent speed and you can configure bandwidth scheduling as well. It comes with RSS feed option and Password protection feature. 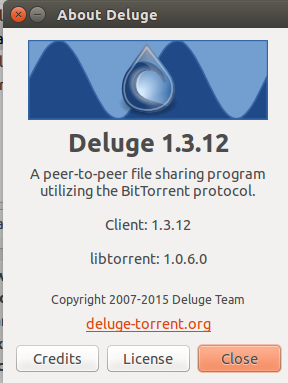 The most recent version of this application, Deluge 1.3.12 is out now. Let’s see how to install it on Ubuntu 15.04 operating system. Deluge 1.3.12 comes with new features and bug fixes, you can always install deluge using the following APT command, but please note that it will install bit old version of this application. In order to install the latest Deluge version, we need to follow the below mentioned steps. Launch your system terminal and run following command to add Deluge PPA to your system package manager. Once the PPA has been added, run following command to update your package manager. There you go, run following command to install Deluge 1.3.12. Launch it from Applications >> Deluge option. Congratulations, start using this wonderful application. Deluge is an extremely easy to use application; it does not consume any high resources on your system and works flawlessly on all desktop environments like GNOME, KDE, Unity etc. Here is official web page URL for Delug.